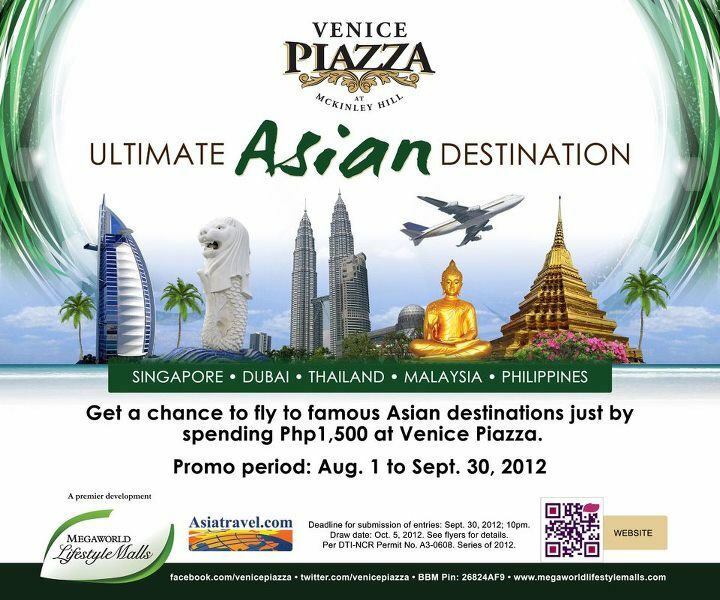 Venice Piazza at McKinley Hill, Fort Bonifacio brings everyone a chance to travel to an Ultimate Asian Destination! 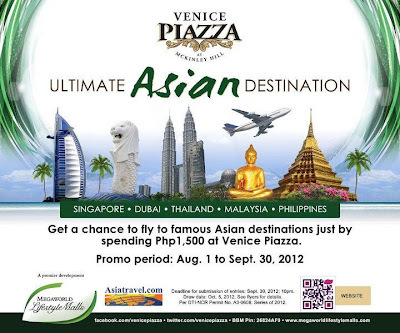 Get a chance to fly to the most sought after tourist destination in Asia simply by shopping and dining at Venice Piazza and other McKinley Hill establishments from August 1 to September 30. 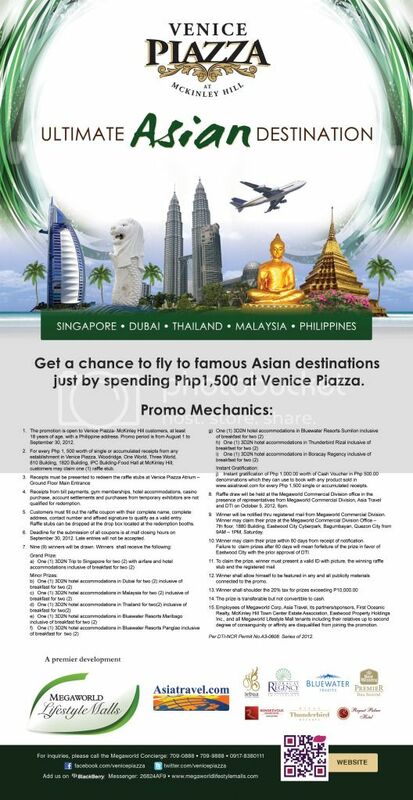 For every Php 1500 worth of single or accumulate receipts from any establishment at Venice Piazza, Woodridge, One World, Three World, 810 Building, 1820 Building, customers are entitled to one raffle stub, which can be claimed at the Venice Piazza Atrium. For my recent Cebu trip, we planned on staying in Cebu City for the first 2 nights and in Mactan for the last 2 nights. We already had a Mactan hotel booked a few months before the trip, so I only had our Cebu City hotel to worry about. I called/emailed some hotels a few days before our trip (but I wouldn't recommend last minute reservations, try to book your hotel at least a week before the trip). And we stayed at Fuente Oro Business Suites. Fuente Oro Business Suites is conveniently located near Fuente Osmeña Circle, One Mango Mall, Robinson's Cybergate and Crown Regency Towers. We booked the Superior Room at Php 1500 per night. After a couple of months, I was finally back at Yabu: The House of Katsu :) This time I was with my friend, Kenny and her special someone. It's been months since we've seen each other personally and Yabu was just perfect for our mini-reunion. After our dinner at One Claypot House, we went to Robinson's Cybergate to have dessert, and we found an interesting cafe called Tablea Chocolate Cafe. Tablea Chocolate Cafe offers mostly chocolate-based treats like hot and iced chocolate, frios, desserts. They are popular for their chocolate-covered cacao beans, which is perfect for pasalubong. :) They also have non-chocolate drinks like coffee, non-chocolate frios, and tea. They also offer all-day breakfast, pizza, and sandwiches. Since my friend and I figured out that we'll be out a lot, we stayed at a dormitory instead at a hotel. And we found Homitori Dormitory. Homitori a two-building dormitory (for men and women). It is ideal for backpackers and for budget travelers. They really have affordable daily and monthly rates that we noticed that most tenants are students. Homitori is strategically located near Magsaysay Park and a few blocks away from Gaisano Mall of Davao. I finally met one of my cooking inspirations, Ate Kris, last July. Ate Kris is based in Germany but can cook Filipino and other dishes from scratch. She was here for a short vacation with her family, so we met up for a delicious lunch at Shang Palace, Makati Shangrila Hotel. Shang Palace is Makati Shangrila's Chinese restaurant which offers a wide variety of Cantonese delights and delicious dimsum during lunch. They also have Dim Sum Plus or unlimited Dim Sum during weekdays. The restaurant is very spacious and has a really elegant feel. There are different dining rooms for either large parties or intimate gatherings.